Coolin' her floof on a hot summer day. Major toe hawks. She's so gorgeous! poor baby! So much floof - it's going to be very hot this weekend! I might give the Butterbean method a try! Poor Bean, all that floof and all that heat. The foot floof KILLS me. Kills me, I tell you. Love it! Hope she's able to stay cool in the heat... love you Miss B. She looks like me when I'm trying to cool off- no part of my body touching any other part of my body. On the floor. Hee! So cute! Wood floors also works for over heated two legged critters too. But we're having a cool day here as its raining and overcast. It's only 94 degrees here today! Oh I love it when cats stretch out their back feet like that - instead of tucking under which is more common. It is so cute! And boy, I didn't realize that Charlene had such big toehawks! The Bean of Floof! What is not to love about this cat? Only Charlene can make that position still look elegant. Wow! And I thought my Fuzz had toehawks!!! Miss Butterbean just earned another title! My girl Marbles has floof - but alas...not a shred of feline or any other kind of elegance! Charlene you are a lovely ladycat! I have to think that if Rhoda were around, she'd ignore all good advice and common sense and pounce on that big, beautiful, floofy tail THIS time. Cataloons! my floofy kitty does this pose too. Bean's got her beat with the toehawks. I give Charlene at least a 9.8 for sticking that belly flop landing on hardwoods. Never heard of "toe hawks" before --I love it. I've always called my girl-kitty's toe floof "crabgrass". Aw, look at those pretty snowshoes! My Binx, Casteylan, and Nala have big fluffy snow shoes as well (and polydactyl toes to go with). They love to skitter on the hardwood floors. Laurie, I hope you and your fellow walkers get a chance to kick back as well after the walk and a great job well done! Beautiful bean, you should make a card out of this one! Sure hope the walk went good. Can't wait to read what's going on. Great job with the fund raising. Of course you had a lot of help! The bean says walking is just too much like work, when one can just do the frog legs! So proud of what you have done for all the kitties! She has **THE BEST** toehawks! You know.... her toe floof! Awwwwww. She's so freaking cute and floofy. 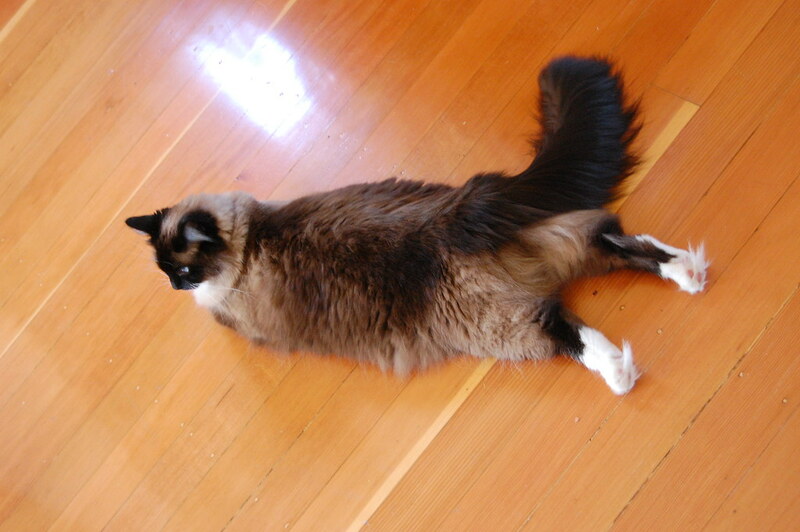 My Nibbler, who is not nearly as floofy, loves to lay on the kitchen (linoleum) floor with her body in that exact position, except she goes completely flat in the hips, with her tail on the floor as well. Nice toe-floof too! Yes, that is amazing floof - but we MUST hear all about how the walk went!! Must tickle the toes (there is nothing like pink little unguarded kitty toes for tickling). Are you and the walkers laid out on the floor with Charlene, exhausted from the walk and the joy of >$21,00? Toe Tuffs - OMG! I want to tickle her Toe Tuffs even though I know Ms. Charlene hates it, but how could you resist. What's with the feet fur rockets?